Forty years ago this week not only saw the launch of the Voyager, our cosmic embassy, probes and also the reception of the Wow! 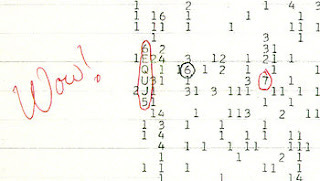 Signal by Ohio State’s Big Ear radio telescope, discovered a few days later when volunteer astronomers were reviewing the print-outs. Though never repeated (and it’s worth pointing out that for all our errant broadcasting, we’re not particularly chatty, either—the pixelated Arecibo message of 1974 is one of the few interstellar missives humans have sent) the strong, narrow-band that blip remains the prime and sole candidate for an alien transmission. The alphanumeric values represents the intensity variation of the signal over about a minute of time and appears to have originated in the direction of the constellation Sagittarius.